Anna Ryder is a musical dynamo; an original and inventive singer-songwriter with a musical style that, although based in Folk, spans an array of genres. She is a multi-instrumentalist and plays keyboard, guitar, banjo, dumbek, accordion and French horn – allegedly the last two instruments at the same time! 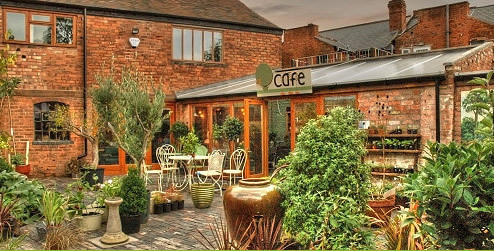 Kitchen Garden Café is a tranquil oasis in the heart of Kings Heath’s busy shopping centre, combining a garden shop, café, deli and meeting room surrounding an old blue brick courtyard. At the licensed Café you’ll find a variety of delicious and wholesome things to eat, all freshly made right here, including an A la Carte Menu on Thursday to Saturday evenings and Sunday lunch. The vast majority of our food is organic and, wherever possible, fairly traded and supplied by local producers. We have a separate children’s menu and play area. There’s also a Deli where you can purchase organic and locally sourced food to take home, including local and organic cheeses, organic wines, beers & spirits, plus jams and preserves made in our own kitchen. And, because we know you want to make good food at home too, we stock a range of groceries and fresh organic fruit and vegetables. You can hire our meeting room or even the whole café for your meetings, celebrations and events. We can supply hot and cold buffets to suit a range of budgets. We also host a number of regular and one-off events, including the Retort (an eclectic mix of music, comedy, poetry and alternative cabaret and the Storytelling Café (bringing storytelling back to adult audiences).